This webpage is dedicated to lots of chrome, big switches, and Type 387 light bulbs. Tel-Ray Electronics, Inc. in the Los Angeles, California area during the 1970's. Morley was the name used by Tel-Ray Electronics, Inc. to market its excellent line of guitar effects pedals in the 1970's. 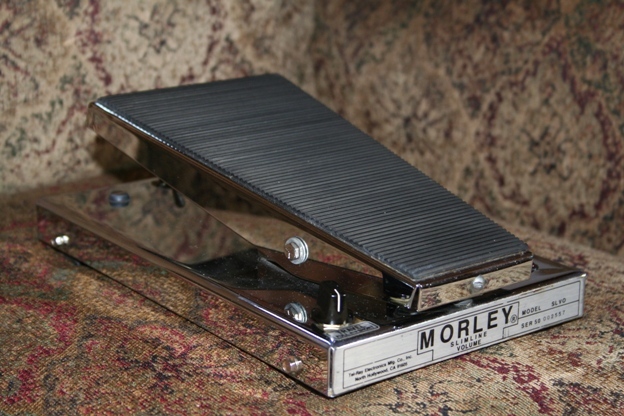 Morley was famous for manufacturing nearly bullet-proof wah-wah pedals, volume pedals, echo units, and other effects devices for guitar. The tall chrome Morleys of the 70's were the Cadillac of their day, both in terms of size and prestige. Ruggedly built with solid engineering, many Tel-Ray Morleys continue to work even to this day. 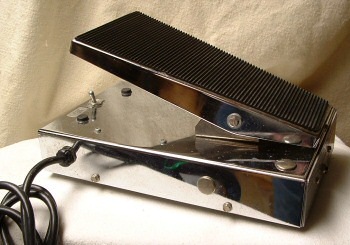 The classic Tel-Ray Morley pedal used a treadle design, with a foot operated rocker pedal resembling the accelerator of a car. The treadle could be moved back and forth to control a parameter, or parameters as in the case of multi-function models. Essentially, Morley took the basic wah-wah rocker pedal format and applied it to other types of effects - volume pedals, echo pedals, phasers, flangers, and so forth. 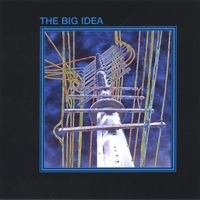 However, whereas conventional wah pedals used a potentiometer driven by a rack and pinion gear setup, Morley broke ground with an entirely new principle. Morley pedals used electro-optical circuitry rather than a potentiometer to control the effect. The foot treadle controlled a shutter inside the pedal that in turn controlled the amount of light reaching a Light Dependent Resistor (LDR). This was a revolutionary and clever design, using simple yet sophisticated circuitry that was entirely new to effects pedals at the time. The advantage of the electro-optical design was that there were no potentiometers in the signal path to wear out or become "scratchy sounding" over time. In addition, the LDRs employed in Morley's Volume Pedal design tended to "load" the guitar less than typical potentiometers, which tended to cut the treble response of an electric guitar when turned down (very annoying); by contrast, the sound of an electric guitar retained its high-end when turned down with a Morley Volume Pedal. Electro-optical circuitry was used throughout the classic Morley pedal line, which eventually included volume pedals, wah-wah pedals, delay pedals, chorus and flanger pedals, phasers, and many others. 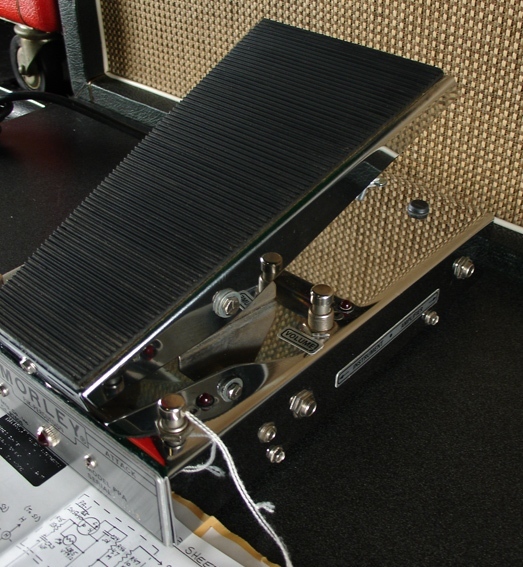 In addition to their electro-optical circuitry, Morley pedals were AC powered. This allowed Morleys to handle considerably more dynamic range than other pedals that relied on a 9-volt battery for power. The Morley company was started by two brothers, Raymond and Marvin Lubow, in Los Angeles in the 1960's. Raymond designed an electro-mechanical echo unit that utilized a rotating disc inside a small metal drum filled with electro-static fluid. This echo unit made it possible for musical performers to re-create echo effects in a live performance without using echo chambers or unreliable tape devices. The Lubow brothers went into business as Tel-Ray Electronics, manufacturing their new "Adineko" echo device for many companies including Fender, Gibson, Rickenbacker, Acoustic, Univox, and Vox. OEM business kept Tel-Ray pretty busy. But never one to rest, Ray came up with another application of the Adineko Memory System. He designed another device using the rotating-disc/oil-can method that simulated the sound of a Leslie rotating speaker cabinet in use by organists and other musicians. The Lubow brothers jokingly referred to this new invention as a Morley (More-Lee as opposed to Less-Lee). Shortly thereafter, Tel-Ray shifted their emphasis away from OEM manufacturing and began marketing their own line of pedals under the Morley name. 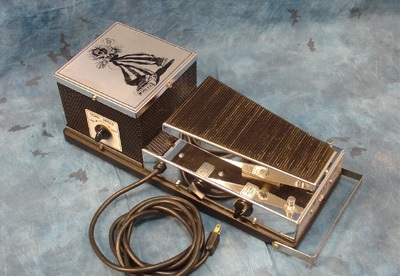 A new treadle and case design consisting of a rather large and industrial-looking chrome-plated housing and rubber-covered treadle was used universally throughout the entire Morley line, which included volume pedals, wah pedals, a Rotating Sound pedal (the original "Morley"), and a pedal version of their echo device dubbed the Morley EVO-1. The large chrome plated housing was used through the 1970's as the Morley line grew to include all kinds of effects, including fuzz-wahs, flangers, phasers, and some very unique devices such as the PKW Pik-A-Wah pedal. Morley even managed to squeeze an amplifier into a Morley chassis, dubbing it the Morley Bigfoot. 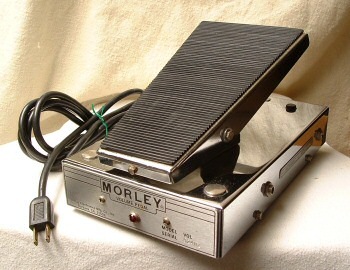 Morley produced many multi-function pedals such as the PFV Phaser Volume, the ECV Echo Chorus Vibrato, the WVO Wah Volume, the CFL Chorus Flanger, and the PWF Power Wah Fuzz. Morley pedals became renowned for their rugged construction (albeit rather large and clunky housing) and overall high quality design. Morley pedals from the 1970's were also unique in the fact that they were AC powered using a standard AC type power cord (no "wall-wart"). 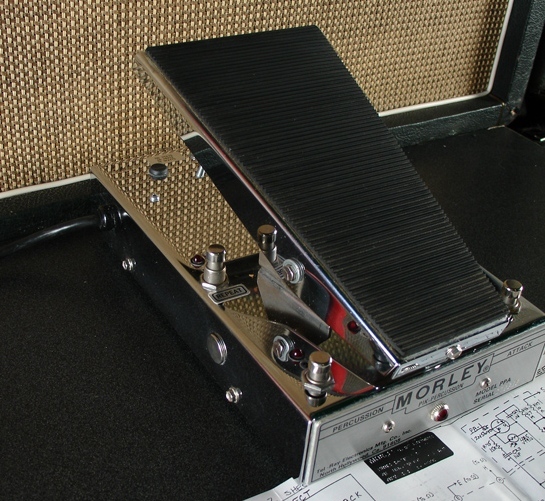 Even today, Morley pedals manufactured during the Tel-Ray/Lubow Brothers period are highly sought after by collectors. 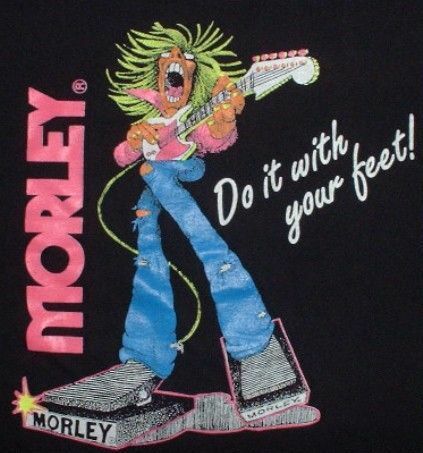 During the 1970's Morley magazine ads featured the Morley Man, a long-haired bell-bottomed screaming guitar-slinger with feet made of Morley pedals. 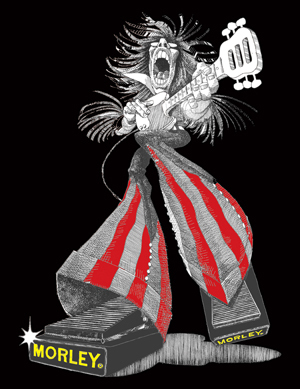 The wild hippie Morley Man was the perfect symbol of the 1970's rock n'roll music scene, and Morley pedals themselves were the quintessential expression of 1970's American style and manufacturing prowess - big, heavy duty, chrome-plated, built-like-tanks, and nearly indestructible. But, time marches on. Boss, a division of the Roland company of Japan, introduced their compact line of effects processors in 1978 and the landscape of guitar effects pedals began to change. Morleys were big and expensive and they began to meet stiff competition from several Japanese companies, especially in terms of size and price (which favored the yen at that time). 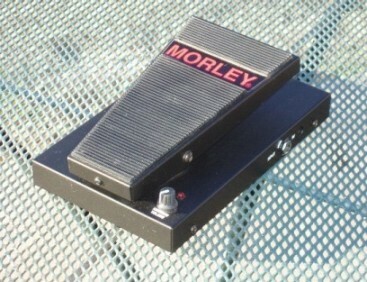 Around 1983 Morley introduced the Slimline pedals that had a reduced chassis height. Although the housing footprint and treadle size remained the same, Slimlines had a shorter pedal throw due to the use of shorter treadle mounting brackets. Initially, Slimline pedals had a chrome chassis and chrome treadle like their bigger brothers. These new generation Morleys were powered by 9-volt batteries, with an AC adapter jack provided for connection to a wall-wart (AC adapter). Chrome Slimlines were built like tanks, just like their tall chrome brothers. They sounded great too, and were dead silent - with no AC running around inside the Slimline pedals, 60 cycle hum was eliminated. Morley introduced several new models in the Slimline series, including the rather weird SSVP Stereo Volume Pan. This pedal used the treadle's normal (up and down) motion to control the volume, but the treadle also moved from left to right to pan a stereo signal. The Slimline series also included the SLEV Slimline Echo Volume, an analog delay pedal that was available in two versions - the 300mS version and the 600mS SLEV-6. Both are excellent delay pedals with a very smooth sound. Morley introduced the Black Gold series and the Silver series pedals around 1983 as well. The Black Gold pedals used a black chassis and treadle and were priced below the Slimline series. The Silver series also used a black chassis (with silver ends) and was priced below the Black Gold series. Adding insult to injury, the Silver series pedals did away with the electro-optical circuitry and used (GASP!) potentiometers. Sometime in the late 1980's the chassis on the Slimline pedals was changed to black as well. 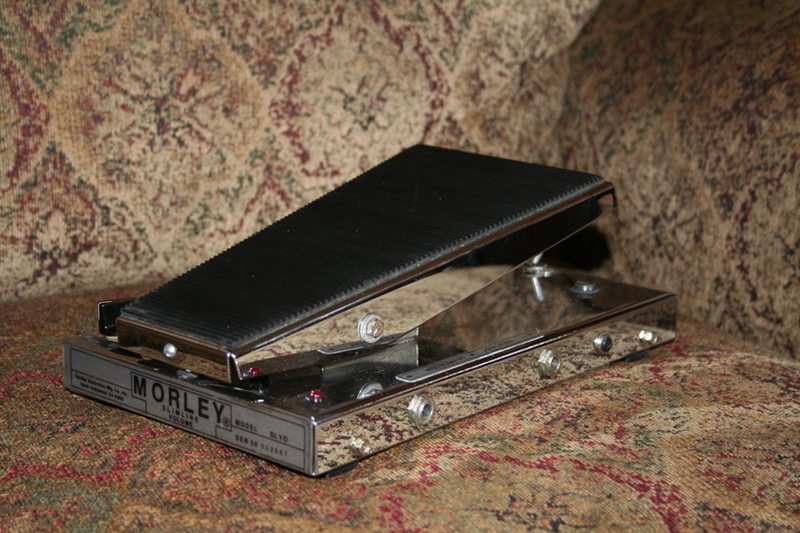 The era of the classic chrome Morley was gone, as Morley pedals evolved in an effort to compete with the new compact pedals from companies like Boss, Ibanez, and DOD. 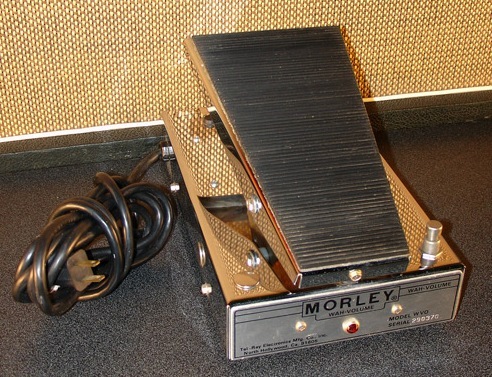 Morley also manufactured their own line of compact stomp boxes (with no treadle) for a while but they met with limited success. Morley was sold to a Chicago based firm, Sound Enhancements, Inc., in 1989. The new company initially reduced the size of the product line and began to concentrate on their core products, wah-wahs and volume pedals. With the explosion of the musical instrument market in the mid 1990's, Morley was able to re-expand its product line and develop several new products. It is interesting to note that the modern Morley company continues to use the electro-optical circuitry and basic pedal layout pioneered by Raymond and Marvin Lubow, albeit with some refinements; Tel-Ray Morleys used a small light-bulb to drive the LDRs; modern Morleys use LEDs. In addition, modern Morleys use printed circuit boards in place of the old point-to-point turret-style wiring used in many Tel-Ray Morleys. As good as the new Morleys are, there are many guitarists who continue to prefer the tall chrome Tel-Ray Morleys. The original Morley pedal, with its large housing and extremely long pedal throw, allows for subtle and very precise control with the treadle. The newer Morleys, with their much shorter pedal throw, make it more difficult to make minute changes. Interestingly enough, I once talked to the folks at Sound Enhancements about the possibility of re-issuing the original tall chrome Morley line. The spokesman for Sound Enhancements said that although they get requests for that sort of thing all the time that they had no plans to do so. Then he went on to say that they can no longer build the tall Morley with its long pedal throw because of concerns of possible damage to the human foot due to the exaggerated pedal throw! Wow - that's weird! I've been using Tel-Ray Morleys for over thirty years now and I'm not hobbling around! For better or worse, I guess modern day regulations about ergonomic design have finally laid the old Tel-Ray Morley design to rest. To their credit, even though there is no direct connection between the modern Morley company and the now defunct Tel-Ray company, Sound Enhancements (uh, err, Morley...) graciously continues to provide documentation in the form of Owner's Manuals and Schematics for the old product line through their website. Light bulbs and some parts, including LDRs - the heart of a Tel-Ray Morley, are also still available through the modern Morley company. Sound Enhancements has periodically released limited edition Morley pedals with chrome plated housings, including a new version of the Echo-Chorus-Vibrato model. Tel-Ray Morleys hearken back to a time in America when a couple of guys could tinker around in their garage and come up with a better mousetrap. And with some hard work they could turn that mousetrap into an empire. Marv and Ray Lubow did just that. With Raymond's clever engineering and Marv's shrewd marketing, the Lubow brothers created the Tel-Ray Morley legacy, bringing new technical innovations to the guitar effects pedal. The Tel-Ray Morley was and still is a better mousetrap. I still like stepping on a tall chrome Tel-Ray Morley. It's like stepping on the accelerator of a 70's American muscle car. Heck, my Tel-Ray Morley WAS the accelerator on my 1970's Marshall-stack 'muscle car'. And, over thirty years later, a Tel-Ray Morley continues to be the stomp-it and tromp-it gas pedal on my Mesa/Boogie guitar rig today. Raymond Lubow, the man most responsible for the tall chrome Morley pedal and its electro-optical design, died in 2002 at the age of 82. To guitarists around the world, Raymond Lubow will always be remembered as the original Morley Man. But the legacy of Raymond and Marvin Lubow and their tall chrome Tel-Ray Morley pedal lives on. If it ain't made of CHROME, it won't have the TONE!